My goal for this year is to be healthy so I'm taking baby steps. I try to walk 1 mile every day, eat healthier and drink plenty of water. My next step will be to get more sleep...that's a doozy for me! I'm a night owl and stay up until 2:00 or 3:00am almost every single night and then get up and teach the kids school. I digress, that's another story for a different day! Back to the the water. I'm pretty sure it was my friend Dawn that pinned some sassy water on pinterest and at that very moment in time I was struggling with my daily water intake. I wanted to drink it because I'm trying to stay healthy and everyone knows you need plenty of water...but I just couldn't do it. I was lucky to get 2 cups or maybe 3 down in a day. I saw the Sassy Water picture and it looked so refreshing. I went out and bought everything but the ginger to make me some sassy water. Over the past 2 weeks I've drank almost 2 quarts of water every single day! I've added lemons, limes, oranges, cucumbers and mint to my water. 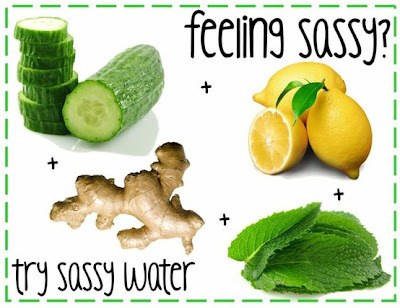 I think my favorite combination is cucumber lemon!